It means they're holding nothing back and are serious to kill us! You're done for, along with this abominous world! Suguru Kamoshida was a scum. I feel a murderous intent! Uh... Anyway, it can't be helped if that's the case. Time for you to go to hell. Persona 5 is out in English, and it's arrived with a shower of praise from critics and fans alike. This should come as little surprise to anyone who played the game in Japanese. It's brilliant and innovative, and very fun. But, there's a problem: the translation is riddled with errors. That's not to say it's unreadable, or completely without merit. But for a massive RPG from a highly successful franchise, it falls incredibly short of the standard it should be held to. A video game is a professional work, no different from any other form of media. 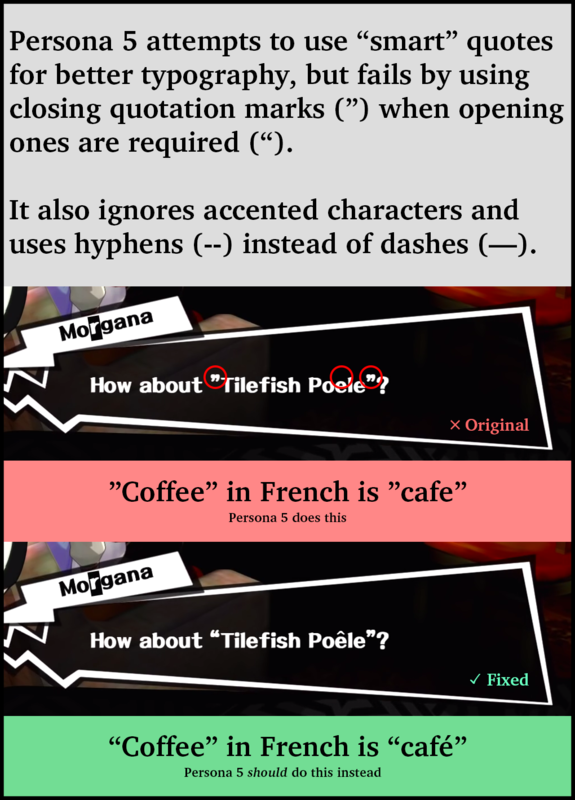 Yet no other form of media would ever get away with the number of errors found in Persona 5's English script. This isn't the 1990s, when localization was still young and errors were endemic. 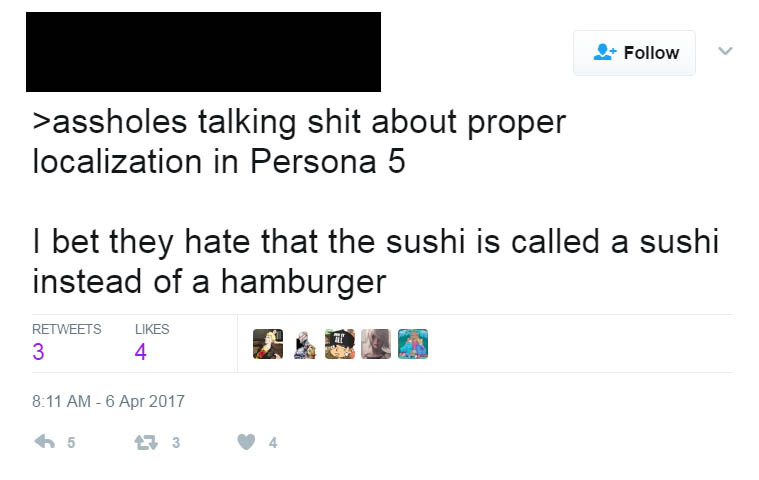 Nor is Persona 5 a small game, or an insignificant one. The baseline for any translation is this: readers of the translation should receive the same experience as readers of the original, as if the original creators had written it natively in both languages. Persona 5's English localization does not meet this standard. Readers are receiving an inferior work containing awkward language, mischaracterization, grammatical mistakes, and outright translation errors. How does “translation” differ from “localization”? What does good translation look like? Why did Atlus release such a flawed translation? Why aren't more people complaining? Can you show me what's wrong? I'll start with what translation is, and what translation is not. Localization is a broader process, and involves adapting content so it's more easily understood in different regions. This generally involves translation, and may involve other adjustments—such as converting between regional measurement systems or exchanging obscure pop culture references for ones appropriate for the target audience.1 However, localization cannot “fix” bad translation. Localization can be a controversial term because of how video game translation and consumer awareness of it have evolved over time. Despite misconceptions to the contrary, good localization will never violate the principles of translation listed above. 1: The trick is to ensure that the reference is equally obscure and has the same effect both before and after, relative to the given audience. A common British reference might be literally impossible to understand for a Japanese reader, so a localizer will attempt to find a common ground that clicks with the target audience without culturally undermining the text. Localization is hard. Translation can be a murky concept, so first I'll define a standard to measure against: imagine if translation weren't necessary at all. In other words, imagine that the original writer is perfectly fluent in both languages and writes both versions personally. That creation—a perfect reflection of creator intent—is the standard to which translators must strive. A good translator, accompanied by their editor and QA staff, gets as close to that vision as possible. By the time they're finished, the only flaws in their work should belong to the creator, not themselves. Occasionally, a translator may even correct minor errors that the creator did not intend to be present in their creation, such as typos and inconsistencies. By extension, adding errors is a cardinal sin and a fundamental failure on the part of the translation team. Translators must be skilled writers, ideally even more skilled than the creators of the works they translate—though this is not always possible. An excellent translator will see deeply into the creator's work and draw out the nuance and fine detail dwelling there. Above all, translation is never a word-by-word conversion. This is one of the greatest translation myths, and one of the most harmful. Translators do not convert words from one language to another: they convert ideas. This is why it's so important for them to understand creator intent. A word-by-word translation will always be a stiff, inferior product that betrays the original work and its readers. Unfortunately, there's no way to know for sure without Atlus telling us themselves or one of the translation staff coming forward anonymously. However, there are some hints at what the underlying reasons may have been. #1: The translation team was massive. 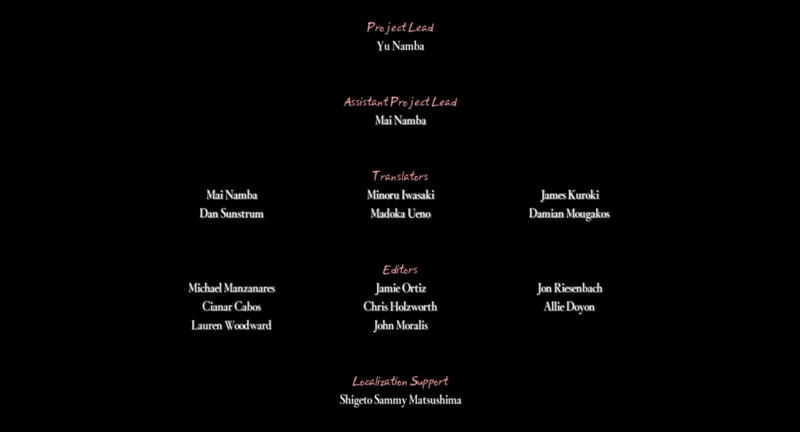 And Namba's claim checks out: Persona 5's credits list a whopping six translators and eight editors as having worked on the project's localization. Those eight editors are especially alarming: their job is to unify the translation, and that's hard enough under normal circumstances. But with more editors than translators, they're actually liable to worsen the stylistic inconsistencies. #2: The release was delayed for localization reasons. “[T]he Japanese release of Persona 5 smashed all our expectations, and as a company, we decided that we owed our fans the very best effort to make Persona 5 our gold standard in localization. Of special note is the mention that they would be "returning" to the studio. This implies that they had already finished recording voiced lines back in November 2016, which necessarily required those lines to have been translated and edited by that point in time. #3: Even voiced lines contain outright errors. Normally, a script will be adjusted during recording to better reflect character voice and fix lingering mistakes. Not so with Persona 5. Now, it's difficult to say exactly what happened. Perhaps there were unreasonable time constraints. Perhaps the localization team was underqualified. Perhaps Atlus had internal issues between its American and Japanese branches—it's not unheard of for international teams to cooperate poorly, and that often hurts localization efforts. Perhaps it was all of these. However, there's one thing we know for sure: this was 100% avoidable, and would have been avoided had the parties in charge cared enough. The developer always has full control over the work. In short, whoever was responsible simply thought they could get away with it. 1: The use of “most number of” is indeed poor English—consider the oddity of “many number of” if it doesn't quite click for you—but we'll cut Namba some slack and blame the editors of Sony's blog. There have been complaints, especially by industry professionals. However, you'd be hard pressed to find a major review site that actually makes note of the errors in Persona 5. And indeed, some people have said that the translation is fine, or even extremely good. #1: Japanese media is relatively niche, and started out even more so. #2: Early official translations couldn't be trusted. The official translations sometimes... sounded good. But while they sounded good, they were also often censored, altered to be more “friendly” in the West, or even completely rewritten. A new belief was born within a significant segment of the fan base: translations that sounded good could not be trusted. Only fan translations were guaranteed to be faithful to the original creation—that they were often stilted and contained untranslated content was proof of this authenticity. And importantly: it was proof that could be identified without knowing Japanese. All it took was a glance and anyone could tell. #3: Japanese translation has a global audience. If English-native fans felt starved for content translated into their native language, fans whose first language wasn't English were even more so. Many ended up consuming English translations in order to experience Japanese media in a language they had at least some knowledge in—and this still happens. Skill levels vary, but speakers of English as a second language are understandably less likely to identify awkward English writing. In fact, flawed translations are often a blessing: the awkward wording, limited vocabulary, and stock lines that appeared in fan translations makes the content much easier to understand for some non-native speakers. #4: Video games are more than just text. This one's pretty simple: if a game is fun enough, it can distract from weak writing. When translated games are dubbed, talented voice actors are also able to supply intonation to awkward lines that makes them seem less so. However, this greatly limits how good their performance can be and results in an inferior dub. The result of the above factors (and more) is that complaints about awkward, literal translation are often countered with accusations of wanting to remove all references to Japanese culture. In Persona 5's case, there's one more factor: people are pretty upset by Atlus's streaming restrictions. Understandably, this has drawn attention away from the poor quality of the translation. 1: And it should not be underestimated just how much work this was, especially for video games. The translators have to get the translation into the game somehow, and Japanese programming practices are famously infuriating to deal with. 2: Consider the memetic line “All your base are belong to us,” which comes from the 1992 translation of Zero Wing. If you look below you'll see a selector that will allow you to browse a list of errors. Accompanying each entry will be an explanation of what's wrong. An effort has been made to keep excerpts spoiler-free. Before you dig in, consider checking out the other questions in the ASK section. To view an answer, just click on the question in the list above. They'll help you understand exactly what to look for and how each example is judged. The errors listed below are a limited sample from a much larger collection, and are confined primarily to the first 5-10 hours of the 100+ hour game. As such, I want it to be completely clear that I do not intend my statements to be a personal attack on the Persona 5 localization team, but merely a critique of their final product. I also want to acknowledge that Persona 5 does contain some inspired lines, and those deserve credit. I very much wish that they had been the norm, rather than the stand-out exception. My hope is that what follows will help people demand better of publishers, ultimately resulting in better games for everyone. 1: The obvious accusation, that the translators were terrible, fails to account for who hired the translators, or how much time the translators were given, or whether the translators were fine but the editors were bad—and so on. Sae's phone rings and she answers it. It's the director. The detective isn't psychic: he's actually referring to a previous call that he had received, not the one Sae is about to receive. And his irate command to “get it over with” doesn't refer to the phone call, but to the interrogation about to take place. 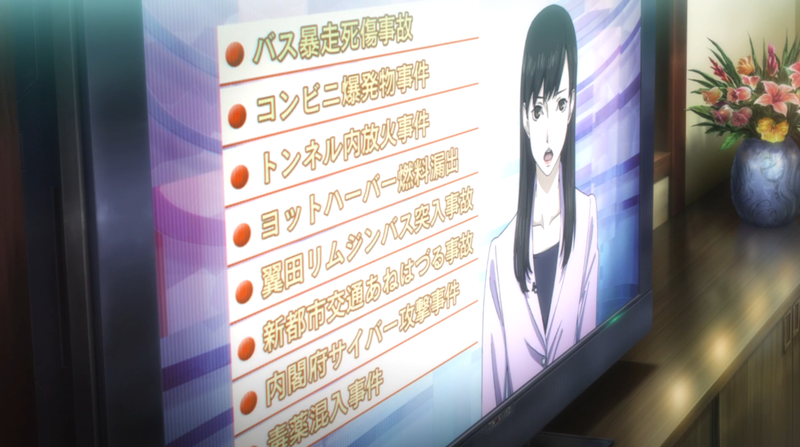 This was translated exactly backwards: Character B is actually saying that the person addressed is not a part-timer. This is backwards: the character in question actually mistook “someone like her” for “Character A's Ann,” not the other way around. Sojiro: Well then, let's go introduce ourselves properly to the staff about your transfer. んじゃ、転校の挨拶しに行くか。 Well then, let's go introduce ourselves to the staff at your new school, shall we? Sojiro and the protagonist visit the school. Principal: To reiterate, just so we're clear, you will immediately be expelled if you cause any problems. 改めて伝えておくが、問題を起こせば、即、退学処分だ。 Now, allow me to make myself perfectly clear: cause any trouble and you will be expelled on the spot. Principal: You might have done a variety of things in hiding in your hometown, but you will behave yourself here. 地元じゃ隠れて色々やれたのかも知れないが、ここでは大人しくしてもらう。 Do not think we'll be so lax as you're used to back home. Misdemeanor is not tolerated at Shujin. Readers tend to be pretty smart, so most will figure out what's going on here. But this is still pretty much nonsense: what on earth does it mean to introduce yourself about something? The principal's lines are awful as well—he starts off almost coherent before descending into grammatical incorrectness and finally gibberish. “You might have done a variety of things in hiding in your hometown”? Click on ALT above to view what a different approach to the scene might look like. Sojiro: Now listen up. Don't even think of doing anything stupid. いいか、馬鹿なこと考えるなよ。 Now listen up. Don't even think of pulling anything stupid, got it? Sojiro: Still, you were expelled once already. To think you'd re-enroll at a different one. しかし、一度退学食らったのに、他へ入り直すとはな。 Honestly, I can't believe you'd enroll at another school even after being expelled. Sojiro: It's not like anyone will be sympathetic with you. どうせ誰も親身に構っちゃくれないのに。 You know what kind of treatment you can expect with a mark like that on your name. These four lines fail to convey a coherent progression of thought: shuffle them in any order you please and they'll make about the same degree of sense. The human brain is excellent at pulling meaning out of nonsense, but this isn't meant to be a puzzle—it's supposed to be enjoyable dialogue in one of the best RPGs of the decade. First line: More or less acceptable; included for context. Second line: First off, this line starts with “still,” which indicates an incoming contradiction to what was said before... but instead it doubles down by reinforcing the previous statement. The use of re-enroll is misleading—he isn't enrolling at the same institution—and the reference to “a different one” never states what the “one” even is (a school). Third line: “be sympathetic with” is a terrible way to say sympathize. But even had that not been an issue, this line just doesn't flow from the previous one. Fourth line: And here we conclude with a non-sequitur. What is happening with the verb tenses? What is meant by what it's “like” at school? How does this connect with the previous point about sympathy? Persona 5 contains an interrogation scene, split into several parts, and it suffers from the most consistently poor translation of possibly any scene in the game. All the lines seen above are from that scene, and all are spoken by the same character. This character is supposed to be intelligent, well-spoken, and insightful, but readers of the English translation would be forgiven for thinking she's one lightbulb short of a cutlery set. The above lines lack personality, flow poorly even in context, and are worded unnaturally—people don't speak like this, even in fiction. Characterization and reader understanding are both harmed, and the creator's intent isn't conveyed. In the above lines, a romantic interest is asking if it's okay for her to move physically closer to the protagonist. A better writer might translate it as “Is it okay if I scootch over?” or maybe “Okay if I get close?” There are dozens of excellent alternatives, but the translation didn't make use of them. The noun form of scum is almost never used as if it were countable: the plural of scum is scum, not scums. (He is scum; they are scum.) Glaring errors such as this knock the reader right out of their immersion, which makes them especially important to fix before release. As for the fourth line: I can't even comprehend how this made it into the game. Aside from the translators, editors, and hypothetical QA completely failing to notice that the line is borderline gibberish, it's even voiced—which means that the character's voice actor was recorded saying this out loud in front of a room of people. The second line is highly unnatural: film shoot, TV shoot, or almost any replacement for filming would improve it immensely. The third line manages to mess up film terminology in yet another way: a TV set is a physical television, i.e. a box with a screen on which one watches TV. They wanted movie set or film set. The fourth line is likely to fly under the radar for those accustomed to bad translations of shounen anime, but it's rather unnatural: nobody ever says “I feel an intent.” Consider also that English has the perfectly serviceable bloodlust. As for the fifth line: abominous is not, in fact, a real word. Horrendous, yes; abominable, also yes. But alas,1 never the twain shall meet. Now, one possible explanation might be that the speaker was simply making up a word for comedic effect, or that it's a quirk of their character. Unfortunately, neither is the case: the context is supposed to be serious and dramatic, not comedic, and the character has no such quirk. 1: Or maybe not; we have enough words for terrible things in the English language. Second line: This is an unclear grammatical mess. What's happening with the tenses? Third line: This is a victim of poor translation. It's both overly vague and extremely unnatural. Fourth line: The speaker is attempting to say that every country has its own way of saying “it's raining cats and dogs,” but readers would have to squint hard and maybe tilt their heads to pick up on that. An extremely literal translation. Fifth line: I don't know which capable woman had her aura stolen so that Makoto's sister could overflow with it, but I guarantee that she'd be happier if this line had been better worded. The second line is just poor translation and lackluster editorial oversight. It's hard to imagine writing this to be even vaguer than it already is: “he ate those inside there” means almost nothing. Japanese gets away with this because of fundamental differences in how speakers communicate, but English gets no such pass. The third line is awkward—people don't talk like this. Even just the two-word combination “reported arbitrarily” shows up fewer than 1,000 times in the 50-100 billion web pages Google has indexed—and most results are from medical or scientific texts, not casual conversation. One first-page result is actually from Persona 5 itself. To start with, this line is spoken by a newscaster in the background, and is supposed to be conveyed in an even, professional manner. The exclamatory, panicked tone is a fabrication not present in the original. The third line is a good example of how people don't speak. It isn't even difficult to fix: “I hope it doesn't delay the trains...” is one simple option; “I hope the trains run on time...” is another. For the fourth line, there was almost certainly a way to render this without invoking Fate/stay night levels of memetic paradox or redundancy. And I guess the fifth line feels obliged to leave an exception for thieves who don't steal from others. Perhaps they only steal things they already own? For readers with no knowledge of Japanese, the juxtaposition of pan and bread—as if they were different things—is likely to suggest that yakisoba pan is actually a sheet of metal used for baking something called yakisoba. 1: Consider also that Gyūdon was translated as beef bowl, even to the point of awkwardness (“beef bowl shop”). Generally speaking, readers require a translation because they don't understand the original language. How, then, are they supposed to make sense of the above? You need significant Japanese language skills to know that the Japanese word for dreadnought is a loanword from English and is written as ドレッドノート, which romanizes to doreddonōto... which is where the “do” comes from. Readers won't understand this, and that means the localization has failed at the most basic level. Japanese culture shouldn't be removed from the game, but it needs to be presented more effectively than it is here. Failing to communicate foreign concepts is as bad as or worse than removing them entirely. And then consider that professional voice actors had to say these lines aloud during recording. You can listen to Ann's voice actress attempt to sell the first line in her character trailer, but the handicap of poor writing really hurts the performance. Overuse and misapplication of vocabulary. For whatever reason, this translation has a fixation on the word problematic. Some instances in the game are fine, but many (such as those above) only make the line sound unnatural. Also consider: how often do you hear actual human beings use this phrase? 1: About as dull and repetitive as if it were done by a machine, in fact. Running the second-to-last line through Google Translate yields “It can not be helped in order to ascertain the truth” as the second suggestion, which is almost word-for-word identical to what ended up in the game. And as anyone in the translation industry will attest: Google Translate's JP-EN translations of creative writing are generally nonsense. Every single one of these lines could have been rewritten to not only avoid the stock phrase, but better convey the creator's intent. Stock phrases mask character voice by making everyone sound homogeneous and mechanical. Line 1: The first half of this line is awkward, and the second half is incorrect: one cannot “do” a feat. (Substitute accomplished and see what a difference it makes.) And the use of feat is dubious in the first place—rehabilitation is a process, not a feat; it's the completion of rehabilitation that might be considered one. Line 2: Elementary verb-tense agreement failure: “haven't you” should be “didn't you.” This line also follows the contradiction in the previous line (“Yet...”) with another contradiction (“But...”), which makes it unclear exactly what the speaker's point is. Here's a quiz: Each line above is said by one of two characters. Which lines belong to each character? Make a mental note of your guess before continuing on. Yep, all of them are by the same character, except for the second line—and yet character voice is so inconsistent that the third line feels much closer to the second than to the first or fourth, even though the second is by an entirely different character. That's a huge problem. Note that I even made the quiz easier by including one of the few characters to possess a distinctive voice.1 Most other characters don't just suffer from a lack of consistency, but a lack of voice that often makes them sound virtually interchangeable. This is a significant step down from the Japanese version. 1: Namely Ryuji, who was Character B—notable as having received perhaps the most personality of any character in the translation. Character A was Sojiro. I prefer literal translations because they’re more faithful. The language is a bit stiff, but everything is still accurate. I like that I can feel the Japanese behind the translation. The game is massive, so mistakes were bound to happen. This is a pretty common view! And it seems to make a lot of sense. However, there's a problem with it, and it stems from the following commonly held belief: that translation is about words. Translation is really about ideas. To phrase it another way: words are just a way for a person to take their ideas and pass them on to other people. If there were no other people in the world, there wouldn't be any need for words, but there would still be a need for ideas. So how does that factor into translation? The processes behind literal translation and faithful translation look fundamentally different. Namely, faithful translators need to understand the original creator's ideas and methodology before they can write anything, while literal translators will just skip to the word phase, causing a degradation of quality in the process. Poor translators worship words. Excellent translators respect words, but worship ideas. 1: Some languages make it harder to express certain concepts than others do (one language might require one word where another language might take five), but those concepts can always be explained. If this weren't true, it would be impossible to learn another language! Unfortunately, while it's possible for a translation to be stiff but understandable, stiff but accurate translations are pretty much a myth. There are several reasons for this. The first is that writing ability is strongly linked to translation skill, and someone who produces stiff translations is therefore more likely to misunderstand the original text. Or they might understand the original, but make a mistake when conveying it in the destination language. Another reason is the fundamental nature of language. Stiff translations generally suffer from being overly literal, and overly literal translations treat every language as 1:1 transformations of each other, as if every language can express the exact same concepts in the exact same way. It's easy to prove that language doesn't work like this. Consider the Japanese ao, which is a color that encompasses both green and blue. English has separate words for both colors, meaning there's no easy 1:1 conversion between Japanese and English. The translator will always have to take context into account to decide whether to translate ao as blue or green. Coming across concepts that don't translate well into a particular language is common for translators. When this happens, they have to consider context and choose the option that best matches the original creator's intent. Creator intent is also the third reason that stiff translations cannot be accurate. An accurate translation conveys more than just raw information: it conveys character voice, personality, and the charm of the author's style. A translation's accuracy is judged by how similar it is to what the creator would write if fluent in both languages. Unless the creator intended the text to be stiff, producing a stiff translation is inaccurate, and a failure. Finally: while it's possible to detect overt errors, it's impossible to judge whether something is fully accurate just by the translation. Check out the first three error samples in the section above for a practical example of this. 1: So if you have to use your hands to carry three apples across the room, one of your two hands is going to have to carry an extra apple. Similarly, translation sometimes requires you to take a word from a single-bucket language and put it into a two-bucket language, or vice versa. It's definitely great to get to experience the cultural aspect of a piece of foreign writing. However, that foreign nature should be expressed by the text's content, not by the text's awkwardness. This goes back to creator intent. If the original creator were perfectly fluent in English, would they have made their writing intentionally awkward just so readers could feel how “foreign” it is? Probably not. And thus, neither should the translator. This argument is reasonable to an extent: translation is difficult, and mistakes do happen. But those mistakes should only be on the order of one misplaced comma per several thousand sentences, or a typo every hundred thousand characters. If the mistakes are frequent and noticeable, then they're unacceptable. Consider—how would readers react if George R. R. Martin released his next book and every third sentence was awkward, with every fifth sentence containing an objective error? Writing is hard, and his novels are long, after all. Yet I doubt anyone would claim those mistakes are fine. At the end of the day, this is the hardest defense to address. At the same time, it's also the easiest. One reason someone might use this defense is that they genuinely don't see a problem, because to them those flaws aren't flaws. And that's valid, so long as they accept other people's right to believe otherwise. Another reason stems from the fear people have to acknowledge mistakes in the things they like. After all, liking something flawed might mean one's opinion is bad or wrong. Or maybe acknowledging the mistakes will ruin the enjoyment entirely. The default response is often defensiveness: those mistakes aren't serious, or they don't exist at all. If this instinct ever grabs you, just remember: it's entirely possible to enjoy translated media and still demand that publishers do better. Because the work deserves it, and so do we. I haven't listed every mistake in Persona 5, or even a substantial fraction of them. I've also been forced to focus on the translation aspect of localization, which means I haven't properly addressed other failings such as bad typography, untranslated images and video, and voiced lines that are unsubbed even when Japanese audio is enabled.1 Nor have I dedicated time to the sometimes strange handling of honorifics. For those aspects and more, I'll have to merely conclude by saying that there are few areas in which Persona 5's localization isn't lacking. That I have to say that about such a great game is unfortunate. If this bothers you even slightly, I encourage you to tweet at Atlus as well as discuss the problem with people you know. Fans deserve better, but publishers like Atlus will continue to produce sub-par localizations if nobody speaks up. 1: Keeping in mind that a lack of subtitles isn't a problem only for people who prefer Japanese voicing—anyone who has hearing loss is affected, regardless of their language settings. And roughly one in five people has hearing loss of some form. This site was created and designed by Connor Krammer. You can get in touch with him on Twitter or via email at connorkrammer@gmail.com. He masquerades as an editor for a living. Special thanks go out to BlackDragonHunt for hacking and translation help, as well as to the boatload of amazing people who contributed examples of poor localization and helped review the site before it went live. This site was written and designed by Connor Krammer. If you like it, you should follow him on Twitter. “Persona 5 MC Red Version 2” by tonyp2121 is Licensed under CC BY 3.0. Light theme version is recolored from original. Persona 5 is the property of Atlus.